Coffee and Coca-Cola, the crackling hiss of food on the fry, the ring of laughter in a bustling room—Diner, written and directed by Barry Levinson, is a bittersweet reverie about the pleasures of noshing and chumming about until the squeak of dawn. An unassuming, small-budget comedy, Diner deftly follows the weaving paths of five friends on a Christmas holiday break in Baltimore in 1959, the year the Baltimore Colts played their second championship game against the New York Giants. As Baltimore pretties itself with crinkly gold Christmas decorations and rows of navy-blue Colt banners, Levinson’s characters—Eddie (Steve Guttenberg), Shrevie (Daniel Stern), Fenwick (Kevin Bacon), Billy (Timothy Daly), and Boogie (Mickey Rourke)—scheme and gamble, cop cheap feels and mull over impending marriages, blow warmth into their knotted fists, reminisce about high school escapades, razz each other into fits of helpless laughter. But no matter what fun or scrapes come their way, the gang always ends up back at the diner, dipping their fingers into heaps of french fries smothered in gravy. When night gives way to a hung-over, blue dawn, the boys stagger to their cars and reluctantly wheel home. Not only is the diner an island of warmth and light in the grim, wintry dark, but it’s a prime hangout for young men trying to extend their boyhoods with foolish antics and uninhibited bouts of gab. Like the Raccoon Lodge on The Honeymooners (where Norton and Kramden fled to escape their wives), the diner is an all-male preserve that allows its members to piddle away the evening without having the women in their lives tugging on their sleeves and reminding them of their—sheesh, groan—responsibilities. Since Barry Levinson himself haunted a Baltimore diner booth in the heyday of Colts Alan Ameche and Johnny U., his movie has an autobiographical savor, but it never turns precious or self-serving; it isn’t a portrait of the artist as a young snack fiend. Blemishes and eccentricities are fondly treated as the bumps that give life its character. When a hefty “building with feet” named Earl (Mark Margolis) eats his way through the entire left side of the menu, he isn’t snickered at for being a gorging slob; his binge is regarded as a wonderful feat. As Earl ambles across the parking lot, the boys at the diner fire off a round of applause. In their eyes, this big, foolish bear is a waddling hero. 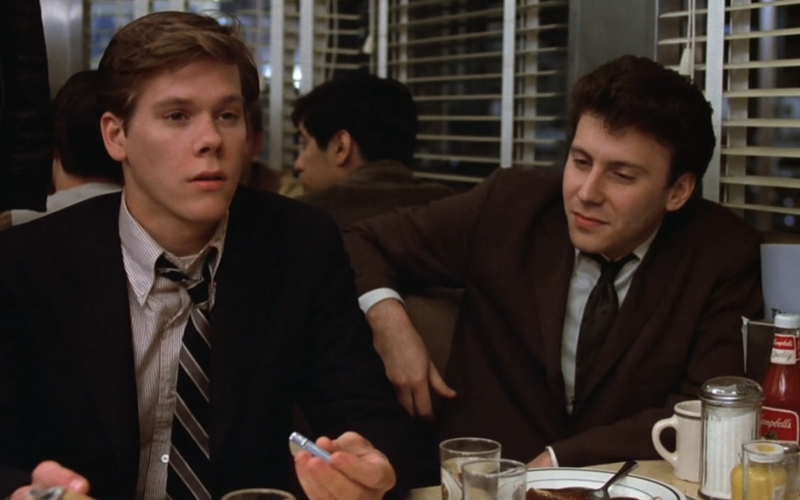 Levinson’s script is an idiosyncratic marvel, perhaps the most generous-spirited piece of comic writing for the screen since Steve Tesich’s script for Breaking Away. Levinson’s script is an idiosyncratic marvel, perhaps the most generous-spirited piece of comic writing for the screen since Steve Tesich’s script for Breaking Away. Early in the movie a deadpan wiseacre named Modell (Paul Reiser) remarks with picky distaste, “You know what word I’m not comfortable with? ‘Nuance.’ It doesn’t seem to be a real word. Now ‘gesture’ is a good word. At least you know where you are with ‘gesture.’” What’s invaluable about Levinson’s script is that it is rich in both gesture and nuance, reveling in slangy chatter and braggadocio without ever turning into a John Cassavetes exercise in motormouth hysteria. Diner is a very talky movie, but the talkiness has shape, point, rambunctious humor. When Eddie and Modell bicker over a roast beef sandwich, it’s like listening to an old married couple carry on a gripe session they’ve had every morning since they were wooing youths—you have the feeling that if the two of them were encased in ice for several centuries, their first words after thawing out would be “Listen, if you want the sandwich, just ask for it…” There’s also a hilariously woolly scene in which Eddie’s mother, unspooling an ancient complaint of her own, pretends that her son is some sort of sinister changeling. “You thing, you,” she growls, playfully pressing a kitchen knife to his breast, “where did you come from? You don’t even look like me.” Levinson is also capable of capping a scene with a crushing flourish. When the sneer-curled, preppie-looking Billy is tossed into the pokey after a scuffle at a Nativity scene, he’s accosted in his cell by a weird old coot who dares him to fight. Staring intently into the geezer’s eyes, Billy says with withering calm, “You lay a hand on me again and I’ll hit you so hard I’ll kill your whole family”—a threat that might make even Charles Bronson pale at the gills. Kevin Bacon, who wades through the suds daily on CBS’s The Guiding Light, brings an infectious laugh and a bleary, amused scrunch of his eyes to the role of Fenwick, a castoff from a rich family who prefers to cruise aimlessly through life in a boozy haze rather than buckle down and be a proper sober drone, like the brother he so eloquently despises. Bacon’s Fenwick is the sort of classic character we’ve all known but never before seen on screen: the articulate, wise-cracking quick study who never finds a place to channel his intelligence and ends up squandering his smarts in a slumming, drunken frizzle. He could easily grow up to be the sort of amiable barstool philosopher who fumes as poetically as Brendan Behan but never finds time to slap the words down on paper. Daniel Stern, memorable as one of the cutters in Breaking Away, shows even more range and subtle tone as the sole married member of the diner clique. With the fellas, Stern’s Shrevie is all sass and ingratiation, zinging Eddie and Modell as they wrangle over the last wedge of roast beef on the plate, but when he’s home alone with the warden, he’s sullen and petulant, his eyes glassing over with rage when his wife misfiles an album in his inviolable record collection. Shrevie is this movie’s true splitsoo, a nice guy who saws his wife’s nerves to a frazzle over adolescent trifles. When he explains at the top of his lungs that Charlie Parker’s albums belong in the jazz section, not in the rock section, it’s like watching Alan Aida sprout horns and poke Carol Burnett with a pitchfork. In its depiction of young people monkeying about in the clatter of night, Diner is going to remind a lot of viewers of American Graffiti and Fellini’s I Vitelloni, but its unswerving fidelity to time and place gives it an offbeat, original charm. Although Diner is a male rite-of-passage comedy, it doesn’t toss the women in its cast meager scraps. In a brief but charming role, Colette Blonigan—familiar to most viewers as the model in television’s Lip Quencher commercials—uses her ice-blue eyes for amusingly quizzical double takes, and as the stripper who shares the runway with Eddie and his gyrations, Lauren Zaganas is a charming chipmunk with a mop of untidy curls. Best of all is newcomer Ellen Barkin as Shrevie’s care-buffeted wife, Beth. With her lipstick tarted up to a loud red gleam, Beth looks like a trapped adolescent trying to persuade herself she’s a grown-up. And in a sense she is a pretender: she’s a young woman who pushed herself into marriage before her feelings had time to sort themselves out and ripen. So she is pitched into a mire of confusion, unable to talk to her sulking hubby, wondering if her looks are beginning to slide. Barkin captures Beth’s doubts and needs with poignant understatement, her face clouding over whenever a passing thought captures her fancy, her nose crinkling in tentative delight when someone assures her that, hey, of course you’re pretty, what a silly question. Her confidence shattered by her shouting husband, Beth can never again take her prettiness for granted. Talented as Diner’s cast is, one performance peeps out above the others. In Body Heat, Mickey Rourke played an arsonist with such ratty, cunning conviction that he seemed to be a creature of damp and rubble, his whiskers twitching in the fading light. As Boogie, a hairdresser who lands himself in the gumbo by not paying his gambling debts, Rourke wears black shirts and salmon-pink ties—the true punk colors. In a way, the character of Boogie is a sly homage to the films of Baltimore sleaze master John Waters, director of (among others) the infamous Pink Flamingos, in which a transvestite named Divine eats dog doo-doo. In Shock Value, his recent book tracing the roots of his warped imagination, Waters has a nostalgically comic chapter titled “Baltimore, Maryland—Hairdo Capital of the World.” Not only is Boogie a hairdresser but his apartment is decorated in kitschy jungle-green drapes and—yes—plastic pink flamingos. Though Boogie looks like a tattered prince of sleaze (his skin is pockmarked, his brown hair tarnished and unruly), he has slender, soothing hands, and he treats women with soft-spoken courtliness. Indeed, he’s the only character who opens doors for women, who murmurs a compliment as he brushes a straying thread of hair back into place. Boogie’s low-rent chivalry isn’t simply a ploy to entice girls into the sack; he really does have a caring soul. When Fenwick drunkenly punches out windowpanes with his fist, it’s Boogie who coaxes him out of mischief, and it’s Boogie who curtails a sick prank involving Beth before damage can be done to her tottering marriage. If Mickey Rourke has a crowning moment in Diner, it comes when Boogie decks a thuggish bookie and his friends whoop with congratulation. Acknowledging their cheers, Boogie turns and offers a grin that is triumphant yet abashed—atilt with foolish pride. There’s no flamboyance or manneristic excess in Rourke’s acting; he simply spins across the screen in his own snug groove, hitting notes cleanly without snarling himself in clumps of static. William Hurt may have reaped all the hype for Body Heat, but it’s Rourke, I think, who’s going to emerge as one of the decade’s major heart-flutters. In its depiction of young people monkeying about in the clatter of night, Diner is going to remind a lot of viewers of American Graffiti and Fellini’s I Vitelloni, but its unswerving fidelity to time and place gives it an offbeat, original charm. Without making a big deal about it, Levinson throws a nostalgic kiss to the Baltimore Jewish community that whittled him into manhood; it really isn’t until Eddie and his girlfriend get married in the movie’s final sequence that you notice how many of the characters are sporting yarmulkes. Although the synagogue is decorated in blue and white, the colors of the Baltimore Colts, with the Colts’ anthem being piped on the organ as the bridesmaids toe their way up the aisle (“I really think you went too far when you asked the rabbi to wear a striped shirt and a whistle,” cracks Modell later), the wedding isn’t a vulgar exercise in Jewish self-loathing like the notorious wedding sequence in Goodbye, Columbus, in which the guest were caricatured as suburban beasties stuffing themselves into a bloated stupor. Here girls in white gloves flex their finger in anticipation of the flung bouquet, Earl affably picks his way through the buffet, Boogie and the gang gather around a table (ties loosened, smiles relaxed); the entire sequence has a hushed tenderness in which every character is given his dignified due and then suspended in time, to be remembered only with fondness. People may come up with dumb reasons not to respond to Diner, just as they came up with dumb reasons not to respond to Shoot the Moon. (Perhaps I should add that I grew up in Maryland under the shadow of the Baltimore Colts, so the movie touches chords in me that will remain unstirred in others.) But I think that if audiences shake off their tired habits and take a risk on a modest sleeper like Diner, they’ll discover friendly, intimate pleasures denied them in blowout epics like Reds and Raiders of the Lost Ark. In one small interlude in Diner, a customer in the appliance store where Shrevie works says he doesn’t think much of these newfangled color sets on the market. “I saw Bonanza the other night,” he grumbles “and the Ponderosa looked faked.” Nothing in Diner looks flimsy or faked. Its world and feelings have the full crack of life.